Michael Carmichael’s family has been part of the General Motors family for a century, but he’s running things his own way at City Buick in Toronto. My whole approach to management is dramatically different than grandfather’s and my dad’s, because times have changed and it requires a different approach,” explains the 34-year-old owner and president of the dealership on Victoria Park Avenue, north of Lawrence Avenue. “I’m a traditional dealer kid. I come here now with my seven-year-old son, and that’s how old I was when I started coming here on weekends, riding the conveyer belt in the parts department, running around, jumping in the cars, honking the horns and driving the salesmen nuts. I started working here part-time when I was 12, washing cars. I’ve done almost everything here. I’ve worked in the body shop, I’ve worked in parts, I’ve done inventory, shipping and receiving, mail runs, and even driven the snow plow. The only thing I’ve never done is work mechanically on cars. I’ve got people on our team who would order me around – ‘wash this car’ or ‘go take this to clean-up’ – and it’s made for some interesting relationships because they say ‘I remember when you started, and now you’re the boss’. And he’s got a passion for cars – and owns a 1960 red Cadillac Eldorado, which is often on display in the City Buick showroom. Michael’s roots with GM can be traced back to 1912, when his great-grandfather, Harry Carmichael, moved from New Haven, Connecticut, to St. Catharines, Ontario, to play baseball. He also landed a job as a pattern maker at McKinnon Industries, which turned out leather and metal products for the auto industry. Carmichael rose up through the ranks, and in 1929 General Motors bought McKinnon Industries, and Carmichael was named president and general manager of McKinnon. The firm quickly expanded under his leadership, manufacturing starting motors, generators, shock absorbers, steering gears and wheel cylinders. It also turned out motors for washing machines and refrigerators. In 1935, Carmichael was promoted to vice-president and general manager of General Motors of Canada. He worked alongside President Sam McLaughlin in Oshawa. “My great grandfather, Harry Carmichael, left GM in 1941 when he was tapped as a dollar-a-year man as head of munitions. He took all the automotive plants and re-tooled them for munitions – and then, later, from munitions back to automotive,” says Michael. “Industry showed a remarkable talent for adapting existing space and technology to fit the needs of wartime production. Harry J. Carmichael – a Vice President of General Motors who had been loaned to the Department of Munitions and Supply for one dollar a year – brought with him a genius for sub-contracting. Called the ‘bits and pieces program’ by C.D. Howe, Mr. Carmichael’s initiative brought scores of small, unproductive factories into production even though the British had rated them as little better than garages at the start of the war. For example, the Canadian Cycle and Motor Co. Ltd. of Weston, Ontario, which had made bicycles and hockey skates before the war, took over the manufacture of armaments including gun parts, tripods for Bren guns, and cradles and pivots for anti-tank guns. After World War II, Harry Carmichael helped industry convert back to civilian production. He also helped his son, Jack, get into the car business. “There was no better business to be in, so my great-grandfather financed my grandfather, Jack, to get into the business in 1955. My grandfather bought a dealership (at Danforth and Main) from Harry Addison, who had owned it for two years. 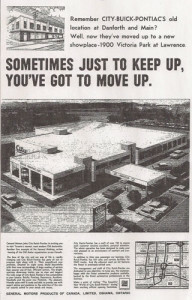 Before that, it was Giles, Rice and Peters, and they sold refrigerators, radios and Chevrolets. 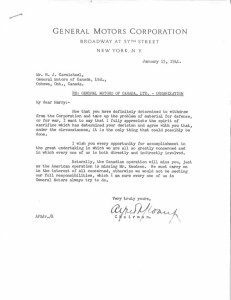 They lost their GM franchise because they were bootlegging to the U.S.” “After Harry Addison sold it to my dad, he went and opened Addison on Bay. He tried to call it Toronto Cadillac, and my grandfather said ‘you can’t sell City and then start Toronto.’ So they had a bit of a brawl,” says Michael. 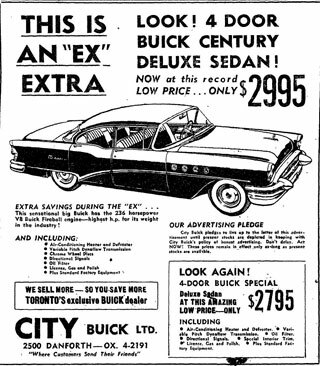 In 1955, City Buick billed itself as “Toronto’s exclusive Buick dealer” and in one ad offered a 4-door Buick Century Deluxe sedan for $2,995 – and a 4-door Buick Special with air conditioning for $2,795. In the same issue of the Toronto Daily Star, Grace Kelly and Cary Grant were starring in To Catch a Thief at the Imperial theatre; George’s appliance store was selling new refrigerators or new 21-inch TV sets for $199.95, or a wringer washer for $99.95. Made-to-measure suits at Hobberlin’s, at 145 Yonge St. just south of Richmond, were sale priced at $86.95. Eaton’s – which had two stores, the main one and College Street – sold groceries, including 8 inch apple pies for 39 cents; chocolate cake mixes, two package for 45 cents; and a 28 oz. tin of peach halves for 59 cents. Delivery was available “for a nominal charge of only 25 cents.” As for new houses, listed in the want ads is a 4-bedroom home on Chatfield Drive in Don Mills (east of Leslie and north of Lawrence) for $16,575. Among the resales, there’s a “executive’s home” in Leaside for $21,500. For just $12,900 there is a two-bedroom brick bungalow near Lawrence and Yonge. And there were lots of jobs to pay for all of these goodies as the economy grew. There’s one for an “Office Boy, age 16-17, for editorial department of a large newspaper, general office work, excellent working conditions, 5-day week, chance for advancement, starting salary $25.” Under “Help Wanted – Female” typists were needed at City Hall. “Starting salary $48.65 per week with progression to $59 maximum.” That was the world – or at least the city of Toronto – when Jack Carmichael was getting into the car business. Then came the 1960’s, and business was booming. 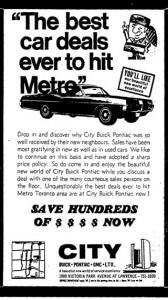 City began selling Pontiacs, which were the best-selling car in Canada for much of the 1960s. City soon also started selling Vauxhalls and Acadians. The new Toronto City Hall, with two curved towers, opened in 1965, and City Buick Pontiac soon used the new city hall in its advertisements. In 1965, Jack Carmichael bought property at Victoria Park and Lawrence, and two years later, in March 1967, the business moved from an old facility on the Danforth to a new building, where it now does business at 1900 Victoria Park Avenue, just north of Lawrence Avenue. A New Address for City Buick Pontiac! Star Advertisement 1967 Visiting the beautiful new world of City Buick Pontiac this week was quite a revelation. Although it just opened a short time ago, already thousands have browsed around the attractive showrooms. Some buying, some looking but all thrilled with the great new look Primarily what impressed me most was the magnitude of the service dept. 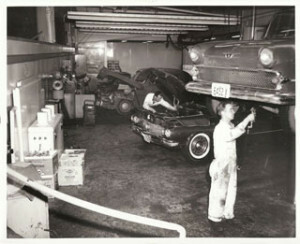 which is now in full swing….Actually this new car complex is comprised of 3 floors, split level fashion. Service reception area, lower level, showrooms second level, and general offices third level. Yes you’ll be more than pleased with the firm whose slogan “Where Customers Send their Friends” will never be disputed…” The official grand opening was held from Thursday, May 4, to Saturday, May 6, 1967. In a full-page ad in the Toronto Star on May 4, 1967, there were pictures of both the old and new dealerships, and a map comparing the two locations. 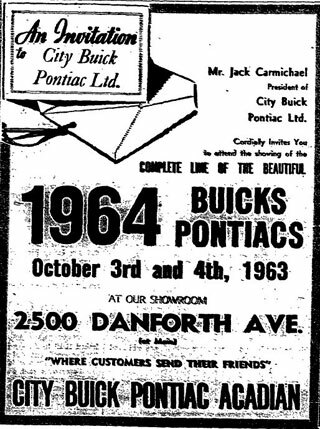 Remember City Buick-Pontiac’s old location at Danforth and Main? Well, now they’ve moved up to a new showplace – 1900 Victoria Park at Lawrence…The face of the city and our way of live is rapidly chancing and City Buick-Pontiac has gone all out to progress right along with it. Their magnificent new premises, situated on eight acres, blend beautifully with their new surroundings…Make a point of visiting “The Beautiful New World of City Buick-Pontiac” during their exciting official opening festivities.” Jack enjoyed horse racing, and one of his horses, Fiddle Dancer Boy, won the Queen’s Plate in 1981. 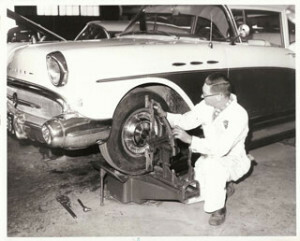 Jack’s son, John, also worked at the dealership. He served as chairman of the Canadian Automobile Dealers Association, was president of the Toronto Automobile Dealers’ Association, was president of the Canadian International Auto Show, and was the founding chairman of the Ontario Motor Vehicle Industry Council. 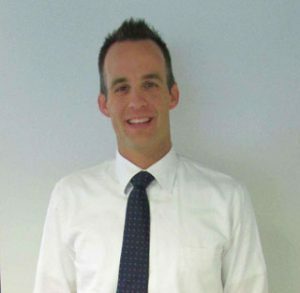 Michael earned a Political Science Degree at the University of Western Ontario in 1999. Then he got an MBA in Florida in 2003. When he bought out his father in 2009, he brought in a partner, the Humberview Group. “When I bought my Dad out, I thought I can spend the next ten to fifteen years paying it off and becoming the owner, or get over that, bring in a partner, own half, and I can go do more immediately. The Humberview Group owns 21 stores altogether. 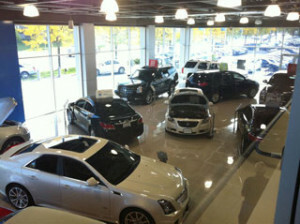 In Toronto, the Humberview Group owns Applewood Chevrolet, Humberview Buick, and Humberview Chevrolet, and is a half owner here of City Buick.” At the 20 other dealerships that make up the Humberview Group, they handle Audi, Honda, Hyundai, Kia, Nissan, Toyota and Volkswagen. City Buick Showroom City Buick ShowroomWith the Pontiac line gone, City Buick has recently been selling Chevrolets, although Carmichael says a lot of people don’t think of the dealership as a Chevy store. It’s no longer business as usual. Carmichael sees big changes in the years ahead. “The model of eight acres, 65,000 square feet, all the cars here – that’s broken. It’s not necessary anymore, nor does it work. It doesn’t matter what manufacturer you are. The computer, the phones, the technology today drives a very, very different customer experience. And their expectations are very different than they were 30 years ago,” says Michael.